The last surviving Medal of Honor recipient from the battle of Iwo Jima during WWII and Co-Founder of the Hershel "Woody" Williams Medal of Honor Foundation, Woody Williams, chosen to flip the coin for the 2018 Super Bowl. I hope we can set an example for our young folk. Hey! We owe something back to America for what America has given to us. It wasn't free. World War II Veteran, Hershel “Woody” Williams, the last surviving Medal of Honor recipient from the Pacific theater during WWII, and co-founder of the Hershel “Woody” Williams Medal of Honor Foundation, is gearing up to toss the coin before the kickoff of Super Bowl LII this Sunday. This will be part of a special tribute honoring those who have received the Medal of Honor, our nation’s highest award for valor that can be bestowed upon an individual serving in the U.S. Armed Services. Woody was honored to be chosen by his fellow recipients to perform the duty of “coin flipper”, as he puts it. His fellow Medal of Honor recipients include: Bennie Adkins, Army, Vietnam; Don Ballard, Navy, Vietnam; Sammy Davis, Army, Vietnam; Roger Donlon, Army, Vietnam; Sal Giunta, Army, Afghanistan; Flo Groberg, Army, Afghanistan; Tom Kelley, Navy, Vietnam; Allan Kellogg, Marines, Vietnam; Gary Littrell, Army, Vietnam; Walter Marm, Army, Vietnam; Robert Patterson, Army, Vietnam; Leroy Petry, Army, Afghanistan; Clint Romesha, Army, Afghanistan; and James Taylor, Army, Vietnam. This group of brave men share the belief that they wear the Medal for those who paid the ultimate sacrifice for our nation’s freedom. This is a sentiment that Woody frequently shares as he travels the country speaking of service and sacrifice. It is that ultimate sacrifice that Woody hopes Americans will remember when he and his fellow Medal of Honor recipients take the field this Sunday. Woody continues to perpetuate the values expressed in these sentiments through his continued service to Gold Star Families through his work with the Hershel “Woody” Williams Medal of Honor Foundation. 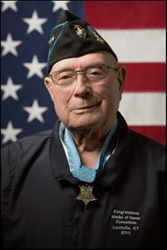 The Hershel “Woody” Williams Medal of Honor Foundation was established in 2010 and is a charitable 501c(3) nonprofit organization that pursues specific endeavors and goals through the vision of Medal of Honor Recipient Hershel "Woody" Williams. The Foundation encourages, with the assistance of the American public and community leaders, establishing permanent Gold Star Families Memorial Monuments in communities throughout the country, providing Living Legacy scholarships to Gold Star Children, and sponsoring & hosting Gold Star Families Outreach across the country. Our mission is aimed at honoring, recognizing, and serving Gold Star Families and their fallen Heroes. "The Cause is Greater than I.."